What is it? – Catastrophic Construction is a clever physics-based shape-stacking game that requires patience and a very steady hand. Who made it? – The game was created by Antriel and Daniel Martin. How does it play? – The game is very similar to other titles like Super Stacker 2 (Gaz Thomas) and Perfect Balance (ttsuras). 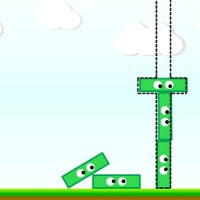 Each level of the game gives you a number of different googley-eyed shapes that you must stack within the confines of a dotted area. All of the shapes must be able to rest in the marked area for a few seconds without any interference to proceed to the next stage. Clicking and dragging allows you to move the shapes around the screen, with your mouse pointer serving as an axis around which the held shape will spin. Inertia and gravity play active roles in impeding exact placement, adding an extra challenge. While it’s pretty easy to figure out where the shapes should go, actually putting them there can be quite tricky. A timer for each level allows you to compete for the shortest possible completion time. Presentation – The game is visually simple and colorful, without any bells and whistles to distract you from your stacking tasks. The eyes of each piece will follow your mouse cursor, which is mildly amusing. The music is on the manic side, and gives some urgency to the gameplay. Positives – Playing Catastrophic Construction is sort of like Jenga in reverse, and is ultimately a lot of fun, provided you’re patient and not completely jacked on caffeine. Being incentivized to stack as quickly as possible is at odds with the natural inclination to take your time, creating a palpable sense of tension. There are three difficulty levels, each with unique puzzles (8 easy, 6 medium, and 5 Extreme). Negatives – The music will probably start to drive you crazy after a while. Fortunately, you can disable it at any time. Why you should play it – Catastrophic Construction is easy to play, but packs quite a challenge. Finishing a particularly challenging stack of shapes successfully is rewarding, and there’s enough gameplay to keep fans of physics-based puzzles busy for a while.